I invite you to enjoy this Bible study about the tower of Babel, the division of languages there — AND the picture it gives us of SPIRITUAL languages today. Math Mammoth printed books sale! Here are some totally NEW Math Mammoth products! 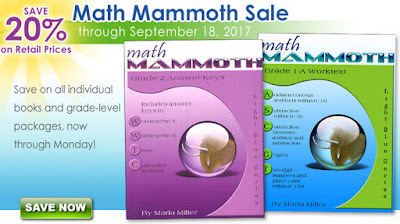 Math Mammoth skills review workbooks have been designed to complement the lessons in Math Mammoth complete curriculum (Light Blue series). These books are designed to provide a spiral review of the concepts in the curriculum, and to be used during the school year, alongside the main curriculum. After a concept or skill has been studied in the main curriculum, it is then reviewed repeatedly over time in several different worksheets of the workbook. Each book contains 70-100 worksheets, and is divided into chapters, according to the corresponding chapters in the Math Mammoth curriculum. Each worksheet is designed to be one page, and includes a variety of exercises in a fun way without becoming too long and tedious. Math Hombre conducted an unofficial favorite numbers poll... the results are interesting! If you cannot wait to read the article, Pi is the winner! Phi is the golden ratio, a mathematically important constantThe number e is extremely important mathematically and ties in with exponential growth. In fact, of their list, e is my favorite!In case you don't know know why 42 made the top ten... it comes from the book Hitchhikers' Guide to the Galaxy and in that book it is made to be the "answer to the universe and everything" (a joke).